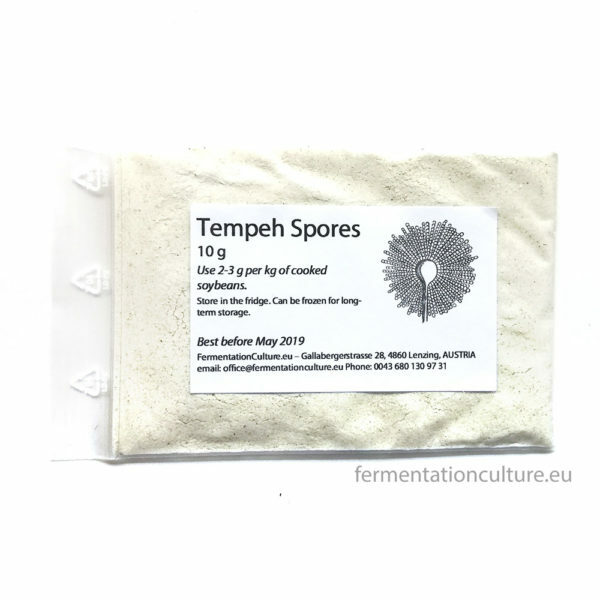 10 g of Tempeh spores. For each kg of cooked soybeans, you will need 2 to 3 g of starter. So with this pack you will be able to make 3,3 to 5 kg of Tempeh. If you are an experienced Tempeh-maker, 1 g per kg of cooked soybeans will be enough. These spores are mixed with rice flour. These are the Raprima brand spores from Indonesia. Best stored in the fridge. Can be frozen for long term storage. Best before May 2019. They will still be viable after May, just a bit less vital. Just use closer to 3 g of starter per kg. I’ve had them tested by an accredited laboratory for Salmonella, B. Cereus and Staphylococcus. All results were negative, which is good ;) Message me if you want to see the papers.